I got these a while back and wasn't sure if I could make them work but they are awesome. 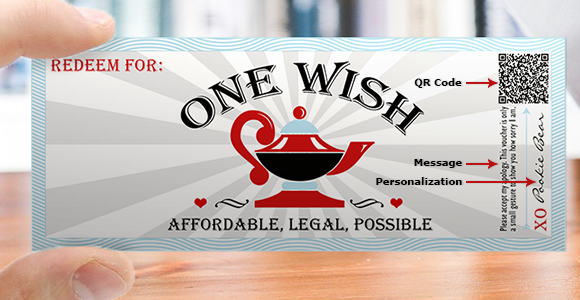 Now I use a 'Wish' coupon all the time for the smallest things I might do. It's become kind of a game with us. Thank you for a great product. 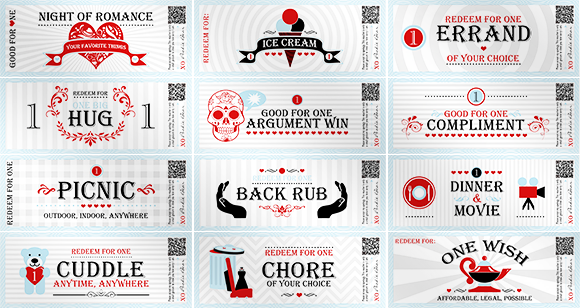 Printable love coupons take YOUR apology to a whole new level—especially when time is of the essence! 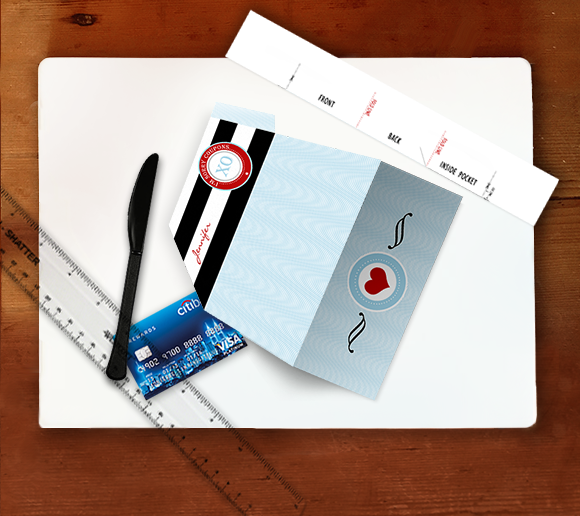 Personalize the envelope with your girlfriend, boyfriend, or spouse's name, & the coupons with yours, and you've got the ultimate 'Sorry Gift' for him, or her. 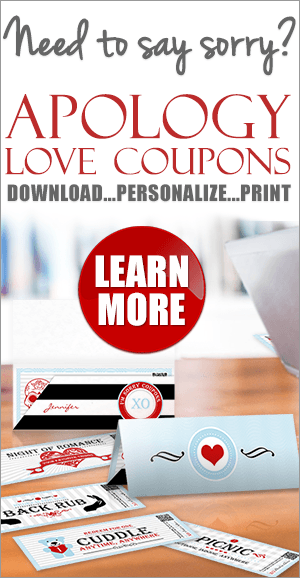 Each of our professionally designed love coupons offers your boyfriend or girlfriend, husband or wife, a different act of love or endearment. From a romantic walk or a simple compliment... to a night of romance or a lunch date... to doing a chore or running an errand—all gestures that help to show them how sorry you are—they're the ideal sorry gift for him or for her. "Please accept my apology. This voucher is only a small gesture to show you how sorry I am." Below that is an arrow pointing to a QR code that contains a different secret message for each coupon, and an XO next to where your name goes. Our printable package comes with 12 coupons but for a LIMITED TIME ONLY we are offering 8 BONUS COUPONS for a total of 20 coupons in all! Use all 20, choose only some, double or triple up on others... Since you can print as many as you like, you are in complete control of what to include. Four pages of professionally designed coupons (the original 12 ➕ 8 BONUS coupons) for a total of 20 coupons! All in a 300 DPI High-Resolution PDF package that you can do download instantly, for only $17.99 Just $12.99. FOR A LIMITED TIME ONLY—That's $5.00 OFF the regular price! THANK YOU. My GF loved these!!! I apologized and handed her the booklet of coupons, I used 5 different ones and 3 copies of the "One Wish" (3 free wishes made more sense to me). I mess up a lot so I'll keep the other coupons for next time I need them. I'm not good with crafting things so the whole package looked a little funny. She laughed when she realized I must of made it, which made her warm back up to me even more. Thank you so much. These were exactly what I was looking for and so easy to put together. He forgave me and loved scanning the coded messages with his phone. I used all of them and will print another set if I need to. What better way to say sorry than with printable, personalized homemade love coupons that show how much you care and how sorry you are? Click on the BUY NOW button below to instantly download the PDF package. Scanning the QR Codes is easy with any smartphone, simply download one of the many free apps that do just that! We like the free version of Qrafter for Apple devices or i-nigma which works on Android, iPhone, BlackBerry—and there are so many others. FULL BODY MASSAGE: I'm sorry that I rubbed you the wrong way. Let me rub you the right way, from head to toe. FOOT RUB: To show you I'm sorry, put me in my place, at your feet, begging forgiveness with my firm and gentle caress. I won't bite, unless you ask. DINNER & A MOVIE: I'm sorry. I give up control; you choose. Whatever food you want, whichever movie you want. DATE NIGHT: Let me take you out and show you how sorry I am - and show you off. We’ll do the things you want to do. BIG HUG: Hug it out. I'm sorry, so bring it in, nice and close. CUDDLE: I'm sorry. Whenever or wherever you need it, one cuddle session coming up. Let me be your teddy bear and hold you tight. FAVOR: Whatever, whenever. As long as it's legal, your wish is my command. SMOOCH OR MAKE OUT SESSION: Pucker up buttercup. Let's lock lips. I'll communicate in the most intimate way to show how sorry I am. RUN AN ERRAND: Send me out into the world to show you how sorry I am. I'll run any errand: post office, dry cleaners, across town. Nothing will keep me from taking care of your business. BREAKFAST IN BED: How do you like your eggs? Stay cozy under the covers; your chef is in the kitchen, proving how sorry I am. I want to unscramble my mistake and make everything over easy. LUNCH DATE: Let me take you away in the middle of the day to show you I’m sorry. I'll make reservations, drive and pick up the check. NIGHT OF ROMANCE: Let's start the night with a dish of my deepest apologies. Followed by wine, candles, dinner, slow dancing, dessert, ...whatever your heart desires. ICE CREAM: I may deserve the deep freeze treatment but let me warm you back up to me with ice cream. Either at home or in a shop, just know that "I'm sorry." ONE WISH: I'm your genie. Rub me like a lamp. As long as it's legal, affordable and possible, your wish is my command. I'll show you I'm sorry by making your desires come true. ROMANTIC WALK: With the moon as our spotlight, hold my hand and walk with me. Let's stroll with only one goal – I'll prove how sorry I am. ARGUMENT WIN: Best way to say I'm sorry is those three little words: You are right. You were all along. Please forgive me for not seeing that first. PICNIC: I'll pack a basket with your favorite foods. Fried chicken, potato salad, brownies, you name it. I'm happy to eat crow – to show you how sorry I am. COMPLIMENT: I love your… everything. I do notice the little things even though I may not say it. I'm sorry. CHORE: I'll be glad to do your dirty work to show you how sorry I am. Can I customize the coupons? The graphics and messages were created by professional graphic designers so the only customization offered are personalization of the recipient's name on the envelope and your name on the coupons. How do I personalize the coupons and envelope? Step-by-step instructions are provided in the package. You simply type in the recipient's name once and the name you want to use on the coupons once, and it will automatically transfer the names to all the coupons and envelope. Since the package downloads as a PDF, the only software needed is Adobe Acrobat Reader (if you don't already have it) which is a free program for viewing PDFs. If you have an older version, consider updating it. Can I print these on my home printer? Yes, they can easily be printed on your color home printer (they're much better in color but work well in black and white too). They are also easily printed at Staples or a Fedex/Kinko's. Any paper will do. For a better quality print we recommend a bright white coated (photo) paper or even a light-weight card stock. Since you're in complete control you can do a couple of tests to see which works best for you and your printer. Do I have to use all the coupons? No, use only six, a dozen, save some for next time, it's really up to you. Since you can print an unlimited amount, you can even double or triple up some. The only thing that can affect the amount of coupons you can use is the thickness of the paper or cardstock. At some point, the coupons won't fit in the pocket nicely. What do I need to do after I print everything? The instructions we provide take you step by step through the process. 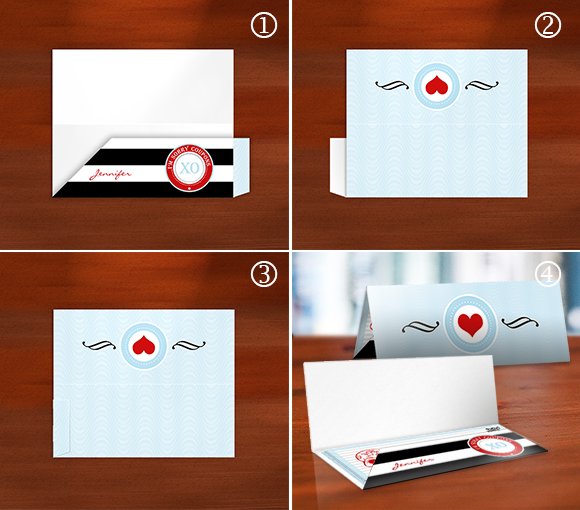 You simply need to cut out all the coupons and envelope, fold the envelope and glue (or tape) 1 flap—that's it! What if my cuts and folding aren't perfect? Throughout the site, we always stress the importance of a personalized and thoughtful gift when apologizing. Even if your cuts and folds aren't perfect, remember a big part of the charm of this gift is that YOU made it yourself! The thoughtfulness and effectiveness in this case really does come from the fact that this gift is homemade, and that you took the time AND made the effort to try and craft the gift yourself. Print out the coupons and envelope on a good quality paper—a bright white photo paper or light card stock work best. Then cut out and separate all coupons. 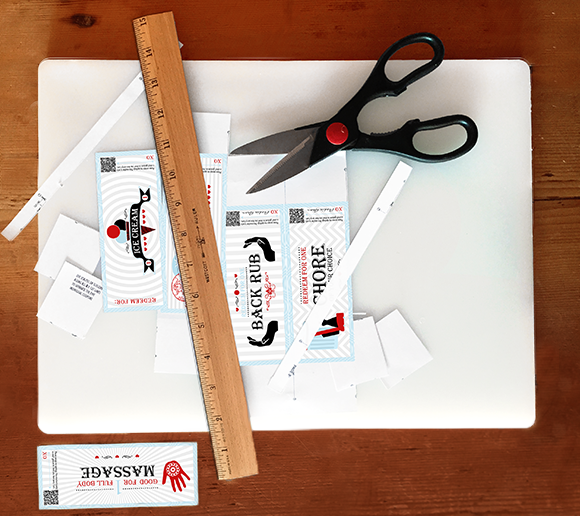 For a more professional look, we recommend using a craft knife/scalpel and ruler instead of scissors. Either way, make sure that your blades are sharp. Cut out the envelope. * Keep the piece that says FRONT, BACK & INSIDE POCKET and shows the fold lines; you'll need it for the next step. You'll need to make 3 folds to create the airline-ticket style envelope. Although it's not necessary, we recommend that you score your paper first to get nice crisp folds. You can use the non-serrated back of a plastic knife or a credit card—any smooth, thin tool that won't cut through the paper will work. 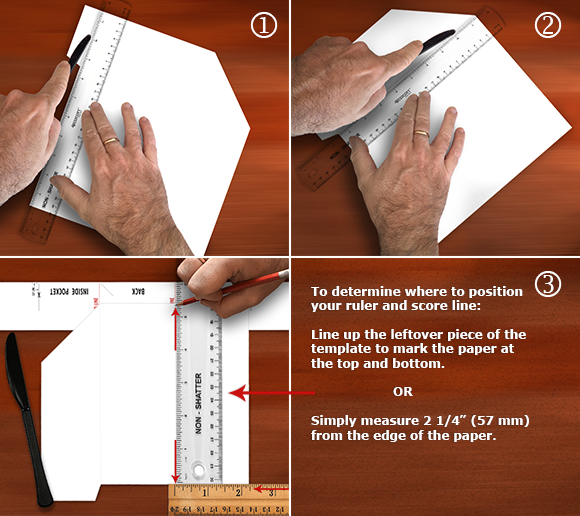 Flip the envelope over so the non-printed side is facing upward and start by scoring the flap and pocket (Steps 1 & 2 below). Even though the non-printed side is facing you, the flap and pocket are easy to identify because of the shape of the envelope. 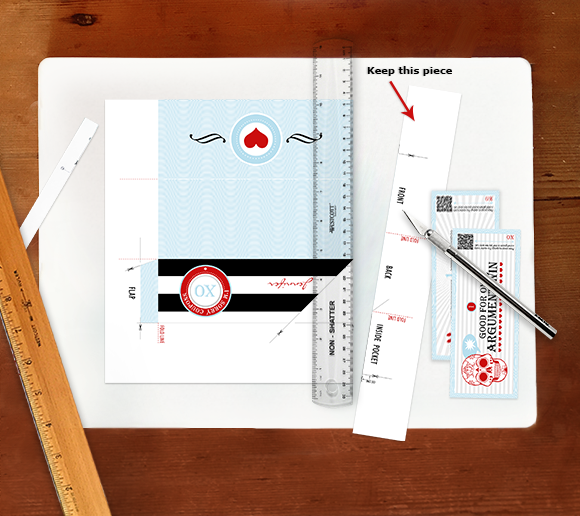 For the 3rd score line, you can use the leftover piece of the template as a guide to mark the position or simply measure 2 1/4" from the edge of the envelope. Mark the position at the top and bottom to line up your ruler. Fold the pocket (1), flip the whole thing over (2) and glue the flap (3), fold the front and you've created your envelope. Now simply place the cut coupons in the pocket. Voila! Then, watch your love's eyes light up when they realize you made a homemade gift!